Since 2002, I give SHODO calligraphy lessons mainly based on "one to one" private sessions as well as group classes and workshops. 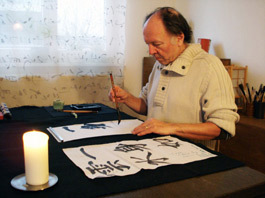 T﻿hrough my teaching experiences in Japan and Europe with multiple age groups and backgrounds, I developed an original effective yet creative way of teaching SHODO. Which I believe works for everyone. I focus on bringing the balance of mind and body together as well as student's individual mindfulness process by specially designed practices. So students can learn little by little how to concentrate on their own Qi flow, conduct and apply it with brush and ink onto the paper. My lesson is totally tailor suited to individual level/speed/interest/needs and provides the most suitable text for the student's technical development in every lesson. 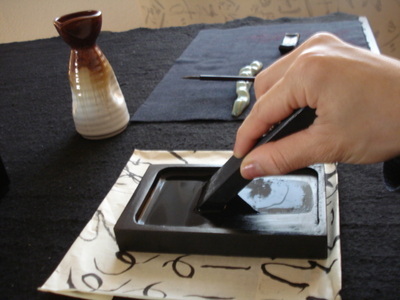 The calligraphy texts are based on seasonal, classics, haiku, tanka, Zen and being prepared for improving sensitive stages of skills, techniques and calligraphy styles.